I have no clue what is it with my relatives and Compaq machines. I it just goes to show that Compaq was once as dominant force on the market as Dell is today. 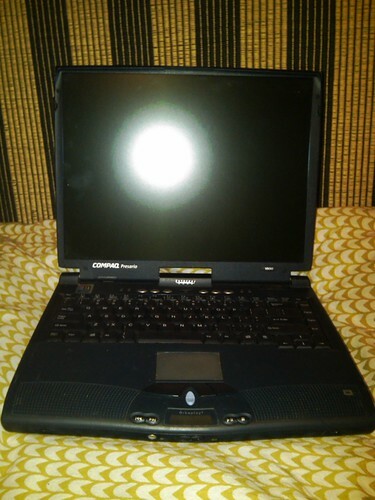 Everyone seems to have an old Compaq or two somewhere in the attic or under their bed. It’s uncanny. The only bad thing about this machine is the fact that the battery is completely dead. So the only way it will even power up, is when you attach it to AC power. Still, compared to the TI Extensa Scholar ESS2 I was messing around not so long ago, this is like a race car. Btw, I eventually got a bare bones, CLI only linux system running on the Extensa, but it crapped out on my before I managed to get the networking figured out. So far I haven’t done much with this machine. When I got it, it was running Windows XP. I don’t know how, but it was running it, and the performance wasn’t actually that bad. I t was sluggish, but workable. I decided to scrap it, and exchange it with something leaner and more fitting. And then I picked the most bloated and performance retarded distro ever: Xubuntu. I made that decision after seeing how XP was rather responsive on this system. I figured that if it can reliably run the bloated MS system, it should handle Xubuntu, no? Well, it can but it ain’t pretty. First off, Xubuntu would not even boot into the live distro on this machine. This should have been a red flag, but I didn’t really pay it any attention. I used the alternative installer instead and managed to get the system running. The good news was that networking seemed to work out of the box. The machine didn’t have any on-board wifi card, and I didn’t really need one seeing how it needs to be tethered to power outlet at all times. The bad news was that it was running almost unbearably slowly. Xubuntu has a nice polished UI but it is a power hungry abomination of a system. With only 128MB of RAM almost everything required swapping. Hell, moving my mouse a bit would usually cause grinding hard drive sounds to be heard. Launching Firefox was a 5 minute ordeal, during which the machine would almost shake from the frantic hard drive activity. It saddens me to say this, but if you have an older machine like this one, XP will actually perform better than Xubuntu. There is just nothing lean or low-end friendly about that distro – it is as bloated and resource crazy as the vanilla Gnome version. It’s just a distro for people who like Ubuntu but hate both Gnome and KDE. 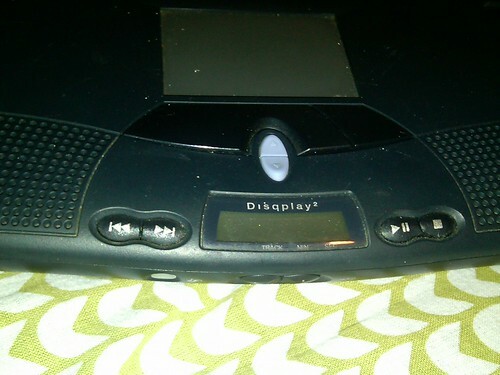 It has little built in LCD display which was supposed to make this machine into something like a CD player. It will actually display the track you are currently playing and etc. I’m not sure if I could get it working under Ubuntu, but it would be neat if I could take it over and use it to display some arbitrary messages if possible. This will require some research. Btw, if you look at the two blue buttons next to the mouse keys – they are my favorite thing in this whole laptop. They are essentially a scroll-wheel replacement and they worked out of the box in Xubuntu. I was able to scroll web pages up and down with them which was amazing. I always hate using touchpads on old laptops which do not implement that whole “drag finger across the edge to scroll” feature. This is brilliant. All the other buttons, except for the volume control were useless of course. My next step is probably going to be installing a command line only Ubuntu system, and some lighweight UI. I might go with Ratpoison again. I’m not sure yet. Does anyone have suggestions? What distro should I try next? This entry was posted in sysadmin notes and tagged tinkering, ubuntu. Bookmark the permalink. Hmmm, I’d be tempted to either try Damn Small Linux on that machine, or perhaps Archlinux with DWM. If I remember correctly, I managed to get along-the-edge-finger-sliding scrolling work on a Presario 12XX but I not the scroll buttons. Go figure. As for the distro, I’d say Arch, because you install a bare-bones system, which you will need with those specs (I speak from experience), and the documentation is excellent. I would suggest trying something lxde based. MINT has a great LXDE version, I havnt tried lubuntu yet, but it should be just as nice. Although if you’re just going to have a commandline only or otherwise ultra-lightweight system, why not just use debian or archlinux? Trying a minimal Arch Linux system with Openbox or something similar would be great. It’s really rewarding getting your system set up exactly how you want it, not determined by the distro. It also means that it’ll be fast on old machines if you’re using lightweight software. I’ve actually used a very similar one not long ago (256MB Ram, though), but I’ve installed Debian with Fluxbox and it ran fine. One thing, though: Firefox is not for those machines anymore. Maybe Epiphany or Midori. Now I use mine has a home file and webserver running Debian Stable. 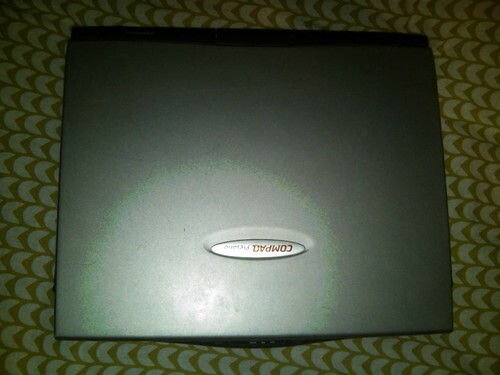 The CD player is probably a standalone that uses the same disk drive and audio port the computer uses, so the little LCD screen is not meant to interact with the OS. That way someone could listen to music with the computer shut down, taking advantage of the laptop battery. A friend of mine had a laptop like this, but with a standalone DVD player built-in. I don’t know what you intend to use the machine for, but if you want something more lightweight you could try going with a BSD. Even if there was a wireless card to worry about, I know OpenBSD has some good wireless card support. You mentioned installing from an Ubuntu minimal CD (I think?). That’s what I do with Debian on low-powered systems. I use the Debian netinst CD, installing just the base system (no X, not even SSH), then apt-get everything I want from the bottom up. As some already said: Arch Linux.. Floats your boat, whatever it is. No ? Then the latest Debian Stable would suit a barebone server perfectly. If you want to play around with new distros, old hardware isn’t the best testing platform. Good suggestions everyone. Btw, DSL did not work. Or rather it worked beautifully but it could not figure out the touch pad and it made the cursor stuck at the bottom of the screen. So far I think the winner is Debian Lenny with IceWM. It runs quite fast, and I installed Google Chrome as my browser which performs much better than IceWeasel. Sadly, I lost the blue scroll button functionality :( There is probably a way to get it back but I haven’t figured that out yet. why not give windows nt a try? Just us Fluxbox as your window manager. The window manager is what actually is using your RAM resources, so you don’t need an entire new distro just a new window manager. I’m currently (laptopwise) on that HP G60 that came out with last black friday for 300$. With Nvidia in the lead with making drivers for linux, hopefully manufacturers will make better drivers for their laptops. It runs well on linux though.. no problems with proprietary audio drivers installed. Too bad it’s proprietary (and costs money) though..
Don’t do it for gramma though, or she will have someone come over and tell her to install windows. This happened to me. After an entire DAY of netinstalling onto this 128mb RAM PoS system I crammed together for her.